In the XLC Monotest we look at the trailer of XLC Bike Parts very closely. 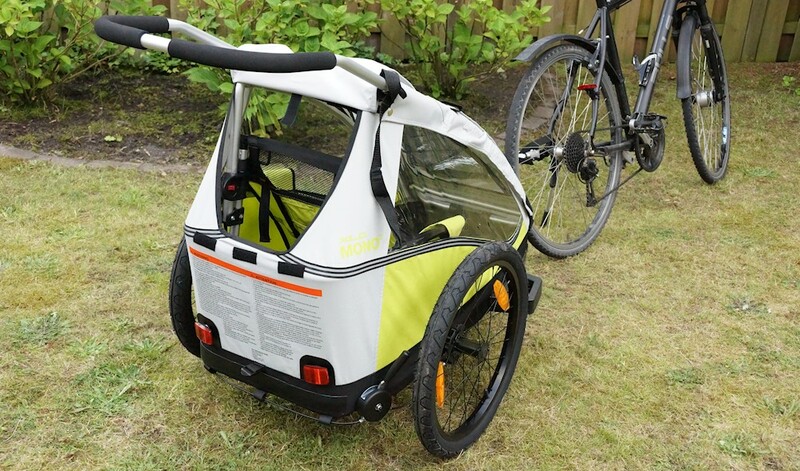 The child carrier is suitable for one person, a child, and can be converted by means of accessories as a jogger. In addition to technical data are interested pivotal in the handling and use in everyday life, as well as the assembly and striking us problems.The price of the child carrier at the time of the test: 409 Euro. was delivered by normal package service, up to the front door. At this size, the parquet, it is quite relevant, since not every such a big car to the carton pick up from the mailroom.Supplied with the following items were included: The child carrier XLC mono, two trailer couplings, an additional wheel for conversion to Buggy, a bracket for use as buggy and an operating and assembly instructions. It was not supplied tool that later under the heading Assembly. 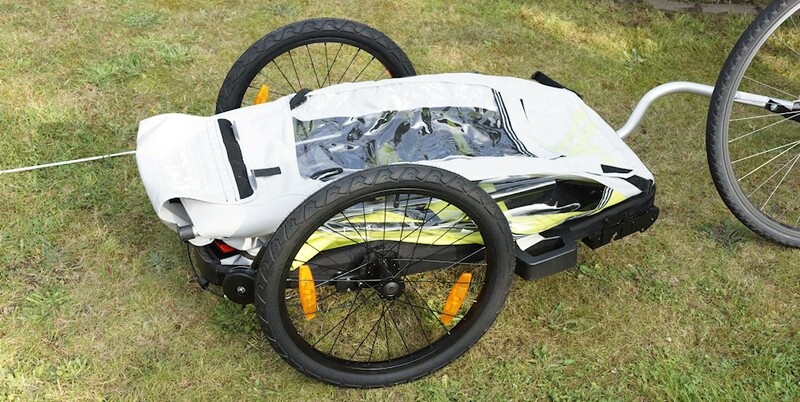 The bicycle trailer could quite easily pull out of the box, here he was in the folded state. The components were in the child carrier and packed separately. Here we ran into a little difficulty. We wanted to take the tire out of the trailer. Not so easy, because they barely fit through the opening. Here you need a bit of tact and patience. The problem was that you would have to rotate the tires, it was hardly possible but due to limited space. All items from the box and the trailer brought, there now came to the assembly. 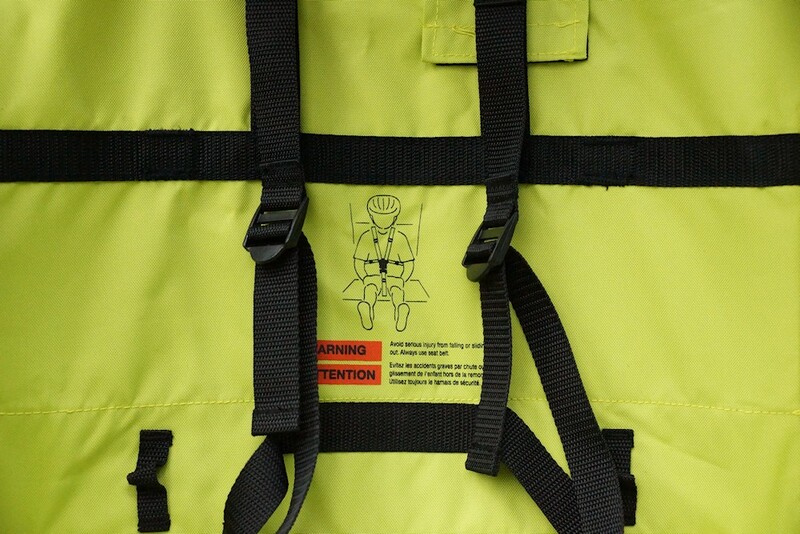 We can only recommend to read the instructions before starting again to look at all the pictures and to seek the parts that you see in the pictures on the child carrier. It may take 10 minutes, but you know, however, where everything is and which part is meant. First we pull the trailer itself from its plates form out and place it on top. For this you can hold it up to the two rods and pull skyward. Quick one notices, the trailer gets its shape. Inside is a click system. Here above the established followers is fixed and gets its grip. For this purpose, however, some force is necessary, not a tool. To lock the system well, coming from behind to the trailer zoom. Now just open the top flap and look inside. The two click mounts quickly left and right visible. The trailer is now in its basic form, next we assemble the tires. The tires are inserted into the axis. So this is going, you have to push in on the wheel hub the round button. is described in the manual, it is a «push» on it, but this label is missing.Nevertheless, the hub can be pushed in. Now the security spheres pull together on the axle and the wheel can be plugged. To remove the wheels pressing the hub back in and pulls the wheels out. This is necessary for example, if you want the XLC single space-saving storage. After the tires are now assembled, we dedicate ourselves to the drawbar of the XLC Mono.This is secured with its own system on the trailer. It is not screwed and allows a toolless assembly and disassembly. The rear split pin is guided into the rear hole of the pole mount.For this, the rod must be made almost at a 90 degree angle and hold the plastic protection from the trailer floor. 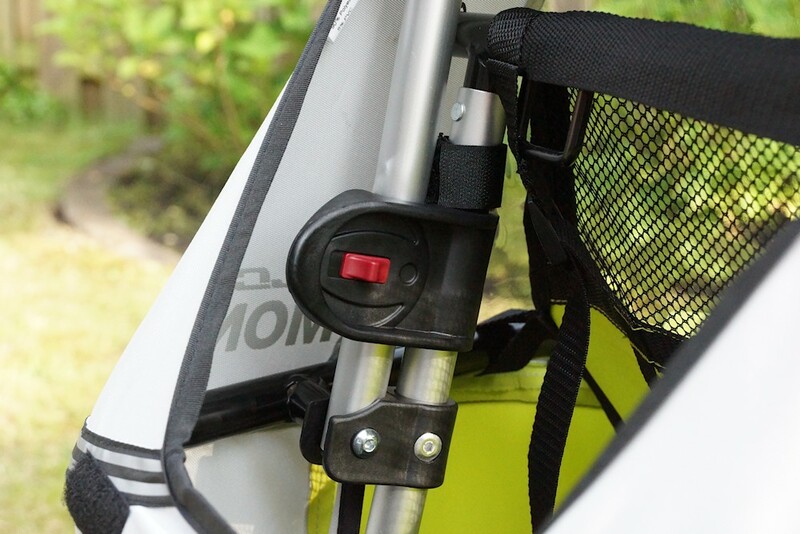 Now you can press levered movement, the drawbar into the device and as long pull upwards until the safety pin can be passed through the bracket and the drawbar.Splint push through and finish. The trailer is almost completely assembled. We still have two distance spacers with reflectors.These are mounted in the running direction in front of the wheels. They are at the end of the widest part of the bicycle, from spacer to spacer. The impellers are thus protected from frontal Aufprälle. The white front reflectors offer oncoming traffic participants the opportunity to assess the trailer in width. For security reasons, you should install the flag for detection. The child carrier is substantially lower than the bicycle and other road users can see these difficulties. The flag is for out the back of the cover into the interior of the trailer. On the left bar (standing behind the trailer), a cloth guide is located by the fiberglass rod is pushed — Done. XLC has delivered two trailer couplings, this proves to be advantageous if you want to pull the trailer with different bikes (mom, dad, grandma or grandpa). In the manual, we have two instructions for installation, even for bicycles with a normal axis and normal nuts and a guide for bicycles with a quick-action lock on the rear axle. Here we see the Note that you can attach the tow bar only to axes, to which the quick-action lock on the right side (the side of the ring gear). Now we have a problem. We can not assemble the clutch. Our quick-locking device is to the left. Here, the additional information is to be read, that one should now see a specialist or a specialist workshop. For the layman, the work is done here and stopped the cultivation. We have summarily rebuilt our quick clamping device and could mount the towbar. We recommend at this point necessarily work very closely and precisely according to the instructions. Anyone who has doubts should consult an expert to the side. The drawbar can now put on the clutch and the child trailers are attached to the bike. In front pedestrian area is a spring. 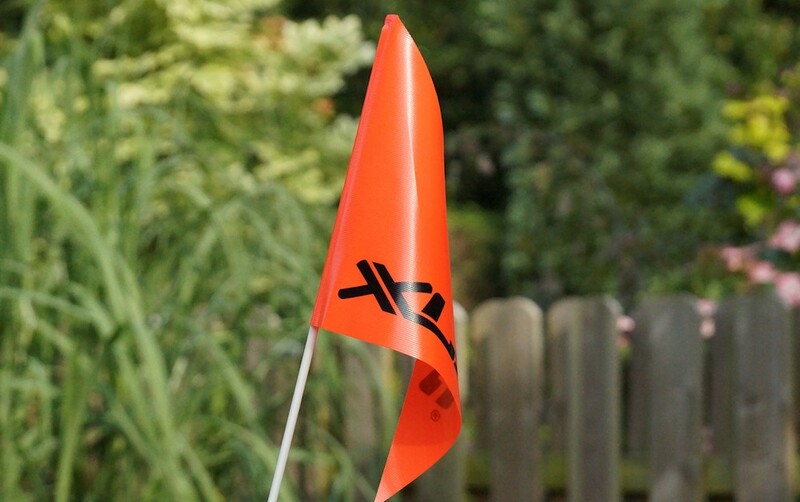 This ensures sufficient movement and flexibility from XLC Mono behind the bicycle. The splint will be put through from top to bottom. Below is a retaining clip which holds the cotter pin. In addition, we attach the tether to the bicycle frame. 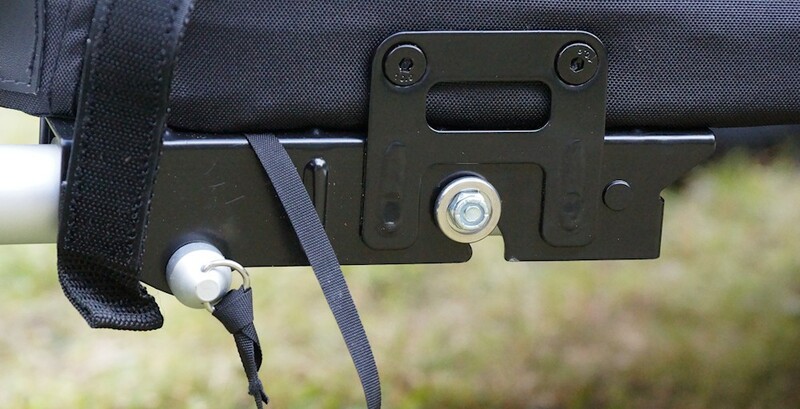 The band keeps the trailer behind the wheel, the trailer hitch or the spring should fail again.For this reason, the tether is mounted behind the moveable spring. The bicycle trailer is now on the bike and we can leave the first round. In the test course no child, because we want to bring the trailers at border situations. * This information is only valid if the minimum vertical load of 3 kg is not exceeded and the maximum vertical load of 8 kg is not exceeded. Processing a quality image. The materials used are well matched and the connection between them has been thought through. Despite folding mechanism of the child carrier makes a solid and stable impression in XLC Monotest. The seams are sewn well, the screen door a high-quality appearance and the clear plastic sides to stand at attention and without buckling. Only the front cover with the viewing window, has creases. This is, however, not be completely avoided, these kinks when you curl the cover to the child to have an «open» fore hatch. However, the fly and insect protection should always be closed. He keeps not only animals but also small items such as gravel or small branches. 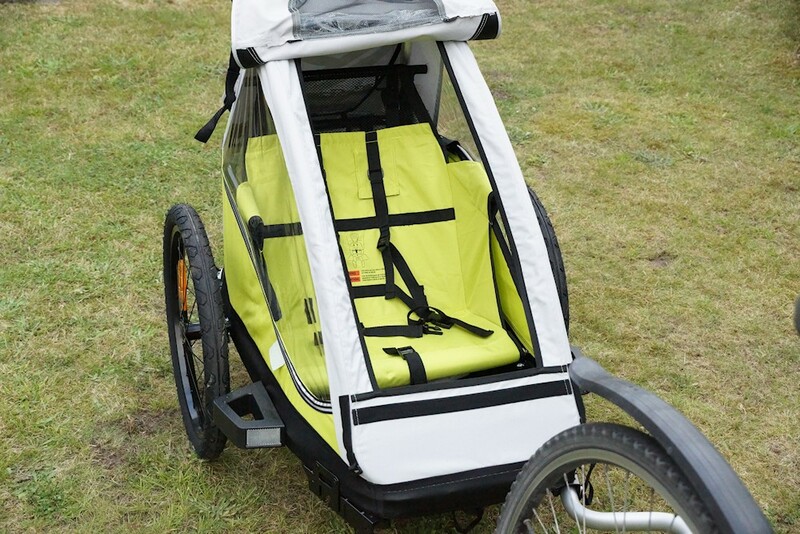 During the function as a child’s bicycle trailer, we recommend the hood to remain closed. The rear wheel whirls up in wet weather water in very dry weather, dust can be whirled up. If you use the child carrier as buggy, the front hood can remain open soothes in good weather. Velcro fasteners are sewn straight and clean, everything closes smoothly so far and there is nothing unusual in tension. The drawbar and other pipes are for reasons of weight of aluminum. The steel frame, here seen the welds very clean processed from. We could only find very little riveted connections, not welded, was screwed. As already mentioned above, has the XLC single child carrier with two white front reflectors.At the back are two red reflectors. As for the underneath support, here the parking brake for the necessary remedial makes. At the rear right wheel, the lever with which you can extend on both sides of a split pin. This blocks the wheels and they can no longer rotate. The trailer is braked and stops even on uneven surfaces. Besides these facilities, and the pennant for protection because its luminous flag falls from afar and can be seen behind waist-high hedges. «Be seen» More about the bicycle trailer test . 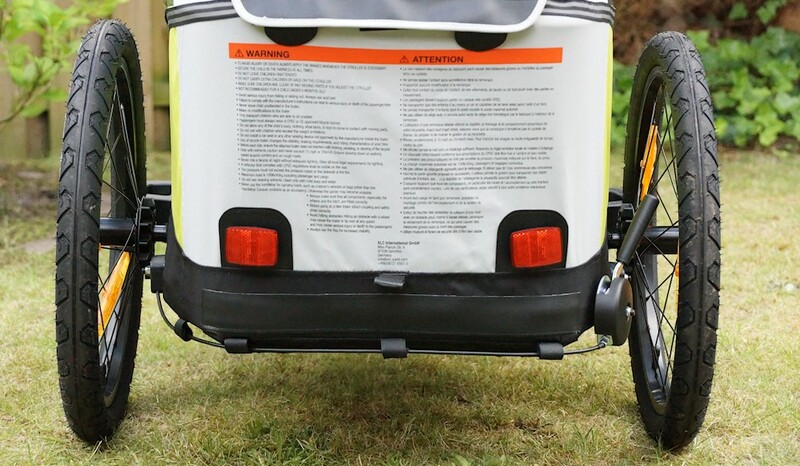 As can already be seen on the technical data of the seat inside the child bike trailer for children aged between 6 months to a maximum of 6 years and a body height of 117 cm (Please note the paragraph about the extensions). When the seat is a seat cloth. The substance which forms the seat, was suspended from the inner frame. The inner, front fastening, because where the knee of the child or the legs pointing downwards is underlaid with a extra padding. So an uncomfortable pressing and pinching on the legs or knees is prevented (depending on child’s size). the Scion is Harnessed with a belt system, a drawing on Sits explains exactly how this is going.A strap over each shoulder and one between the legs. Here comes a kind of 5 point harness for use. So that this can continue to perform its function, it is particularly important that the straps are not set too long, the child must however be not too tight strapped. Since the child carrier has no suspension, it is important that the child does not jump high with a bump in the seat. The drawing shows a child with a bicycle helmet . This is a good indication and reminder. The XLC single child carrier should be like any other of its kind used only with appropriate bicycle helmet. 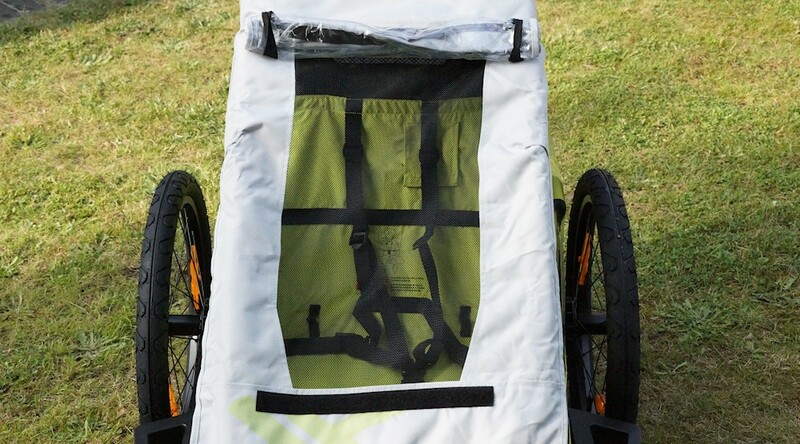 The bicycle child carrier has supplied us with a little buggy Extension. Optionally, there is the possibility to do the trailer rebuild as a jogger. For this, the drawbar is removed and a second pole, with a holder for a 16 inch spoked used. The handle as for the buggy-tag remains the same. Toolless mounting of the shafts of the conversion is done in a few minutes. 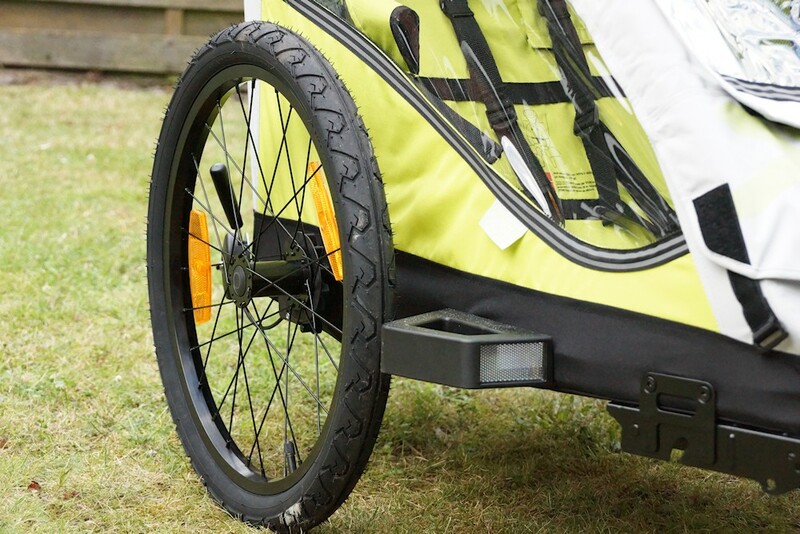 The conversion to a stroller is very easy to you put the small auxiliary wheel forward in the holder under the trailer. The two rubber caps at the rear end of the trailer moves from one and the additional handle is inserted into the pipes. nor fix now with a safety split and the buggy is ready for use. The cargo space in the back of the child trailer provides enough space around the buggy wheel and carry the auxiliary handle. The conversion can therefore take place without any problems at the destination. To put an infant in the trailer, you should buy possible enlargement of the infant carrier. Once you drive off, you realize the trailer on the axle. Even without the child almost 15 kg, and might find a quick note here, you first have a gear down. But that is not negative and many adherents that. One is reminded just because you’re traveling alone. Especially in the first few journeys can be the width is not well estimated and looks every now and then backwards. One has to keep in mind that the team is now wider than the own link, one has in mind. Turn and narrower roads you should always do wisely and a view to the rear. Just because the lead bicycle is around an obstacle, it must not be the trailer. The XLC Mono BS-C01 you get a high-quality child carrier. The processing makes a good impression and the material was placed on quality. The trailer is set up quickly and easily with its easy installation. To fill the tires with an air pump Schrader port (car valve) is required. What we have not found a TÜV seal or another, official marks. In the manual, however, we find the statement: «The following standards were taken into account: E015918: 2011 and A1: 2013, EN1888: 2012». Also it is pointed at the back of the trailer that the trailer is to be used only with a helmet with a corresponding mark. Thus, the manufacturer has kept her about current and valid standards. From us the trailer receives the XLC Monotest 4 of 5 stars and reaches the test grade of «good». Note for Test Procedure: For our test we have for security waived with a child to ride. The testing of borderline situations curbs, traffic lights and narrow streets would have been too risky. Instead, we have placed a weight of 20 kg in the trailer and secured with safety belts. Bike magazine has not tested the child carrier on security or pollutants. The focus of the test is to use in everyday life. To point deduction led: No seal, possible complication by a quick on the wrong side, missing labeling is made to the manual. The seat we have tested in the state with a child. It should be read in any case the user before use.